Wil Trapp wore the armband last night in a 0-0 draw between the US and Bosnia and Herzegovina that marked the end of this year's January Camp. Columbus GK Zach Steffen and new Crew signing Gyasi Zardes also featured in the friendly. The match was more or less a frustrating end to the three week-long "camp cupcake." Younger players were expected to be featured but head coach Dave Sarachan seeming opted to go for what he thought would be a win by using older, more experienced, ones. Up top, it was CJ Sapong (29), who had a good MLS season last year, was replaced by a seasoned Juan Agudelo (25) were not able to add much to the match. In the midfield, we saw some younger players, but only one could be really considered a "young player" in Tyler Adams (18). The other four are well known MLS commodities. On the wings, Sarachan went with decidedly non-wing like players in Jordan Morris and Gyasi Zardes. In the middle of the pitch we saw Christan Roldan (22) and Wil Trapp (25). In the back it there were two under the age of 25 in Matt Polster and Walker Zimmerman paired with two 30-year-olds in Ike Opara and Justin Morrow. Bill Hamid got the start in goal. It was a messy game because the lineup was lumpy. 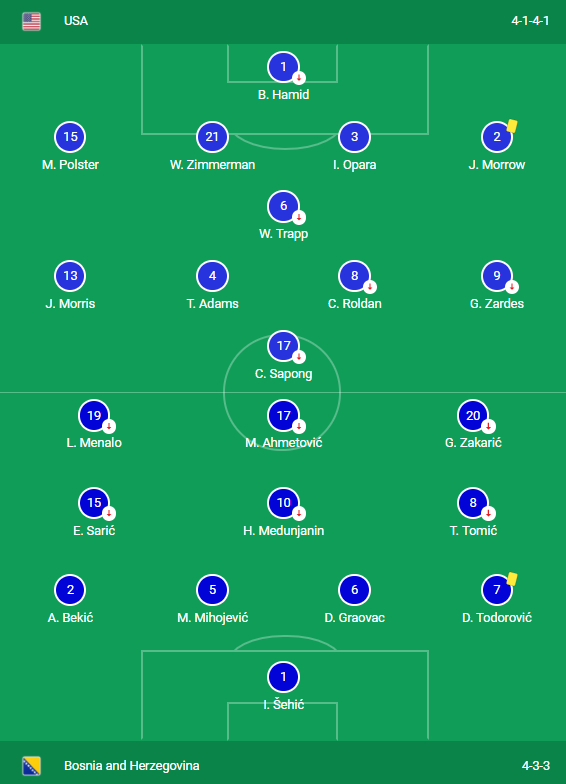 Trapp held things together in the back but because of the relatively poor play of Jordan Morris and Zardes the US never approached anything in regards to possession. Bosnia and Herzegovina, for their part, played pretty good. It was a "C" team missing guys who are currently mid-season overseas. January camp is used to be a sort of primer for the MLS season. Players are selected from as many MLS teams as possible for exposure with the goal of putting a couple in the net against a weakened side playing far from home. By this measure, the USMNT failed. Later today we will see MLS roll out a new plan for their Miami franchise. USSF/MLS picked today because, in a perfect MLS world, I think they wanted a result from the team of MLS-ers the night before to help with momentum. They didn't get it.